barbie in a Mermaid Tale 2 - Royal putri duyung. The boneka aren't new to us but I found out something interesting about them. Check out the komentar for lebih info.. HD Wallpaper and background images in the film barbie club tagged: barbie in a mermaid tale 2 upcoming movie dolls mermaids royal mermaids 2012.
" 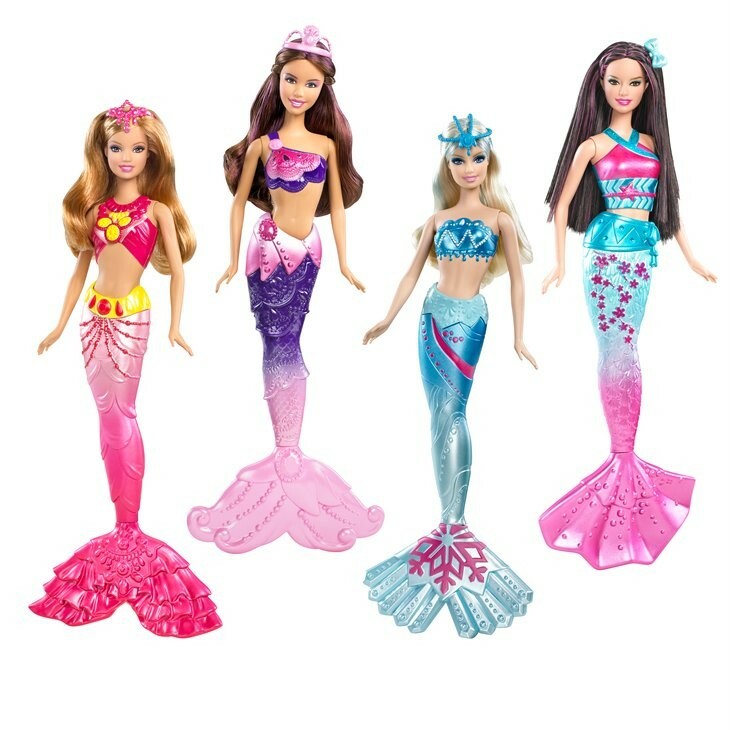 Barbie™ in a Mermaid Tale 2 Mermaid Assortment: In the movie Barbie™ in A Mermaid Tale 2, these magical Royal Mermaids help Merliah™ save the ocean! Each mermaid princess has a beautifully detailed bodice and exquisite mermaid tail inspired by the oceans from around the world. With bewitching color change features, girls will love playing with them in or out of the water. " And I thought Merliah was the only mermaid princess in this movie. Hm, the tails inspired by the oceans around the world part sounds somewhat interesting. But other than that, I don't find these dolls any fascinating. To be honest, their faces look weird to me. Too many characters and dolls, Mattelz had gone CRAZY!!!!!!!!!!!!!!! The faces do look weird. Mattel doesn't put much effort when it comes into doll-making any more. Gotta like 'em all. Especially left one. But I wonder: why third from left is snow-themed, and last one is totally East-themed? Something new. Which oceans are they? The right-most looks like it's in the Pacific one. The first one to the right is either Antarctic or Arctic ocean. The others? Me don't know. You're right about the right two. The second from left is probably from the Pacific or Atlantic Ocean (both are around South America) and the first from left is probably from the Atlantic Ocean (Europe). Dassit. They're Ocean mermaids. Something new. And does the violet mermaid's tail looks like Elina's mermaid tail from M? They just had no fantasia how to make her tail different from others.